Article: Lauren Taylor Mesmerizes The Crowd As She Performs At The Del Mar Fair Opening Day! She’s a brilliant and outstanding actress and a singer with a voice like no other! The immensely talented, Lauren Taylor is one word – perfection. Fans worldwide know the remarkable Lauren Taylor as she exhibits her stellar talent in the Netflix show, “Richie Rich” and this radiant, young lady continues to grow her fan-base more and more as the milliseconds go by as she becomes Disney Channel’s newest princess in the premiere of her show, “Best Friends Whenever” on June 26th. In addition to being such an awe-inspiring actress, the excellent Lauren Taylor is one gifted and accomplished singer! 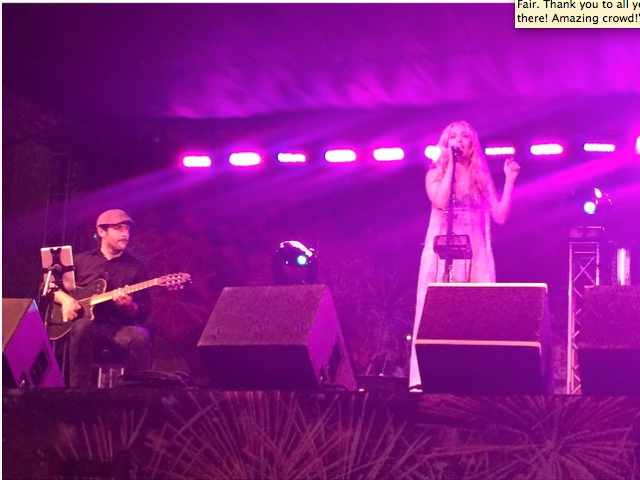 Lauren Taylor has such an angelic and mesmerizing voice and just recently performed at the Del Mar Fair Opening Day on June 6, 2015. The incredible Lauren Taylor shared the wonderful photo above through her Instagram account and wrote, “Had a fabulous time playing opening night at the San Diego Fair. Thank you to all you boothangs that were there! Amazing crowd!”. For the Lauren Taylor fans who were not able to see her fantastic performance live, the lovely Lauren Taylor shared a video of her singing “Dog Days Are Over” at the Del Mar Fair Opening Day onto her YouTube channel! Her voice truly gives chills to everyone listening with just how fabulous it is! Check out Lauren Taylor’s cover of “Dog Days Are Over” at the Del Mar Fair Opening Day below! Magnificent job, as always, Lauren! Previous Article: Lauren Taylor Looks Stunning At The Premiere Of “Inside Out”! Pictures & VIDEO Here! Next Article: Basketball Legend, Carmelo Anthony And Nickelodeon Team Up To Create “Turtles By Melo”!